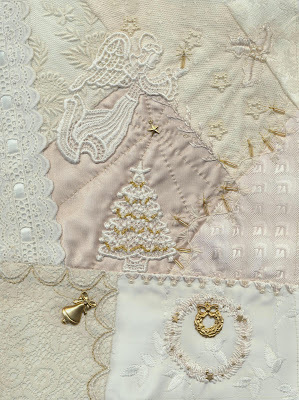 I finished the Christmas block this morning and would like to thank Colleen from CQInternational because if she hadn't suggested "Chains" as the April mini-challenge, I never would have thought of doing a Christmas block. When it was finished but "missing something", I asked DH what he thought it needed.......he suggested the gold star above the Christmas tree with the lines running from it and a gold charm of some sort in the bottom left hand corner (I found a bell, candy canes, a ginger bread man and a snowman) and the bell seemed to fit the best. I included the strip of broderie anglaise with the ribbon threaded through it because it represents a child in a nightgown anxiously waiting for Santa Claus. So, moving on to block 16 with the May mini-challenge of Stripes. WOW that is very lovely and hubby's suggestion is just perfect in my opinion!!! Nifty chain idea too! I LOVE the bugle candles too. Viv not only are you the most extrodaniary embroiderer I know but also you havae an awesome husband who gives fab suggestions that just suit the block so well- Gorjus!! Awesome cream blocks Viv. I envy your natural talent.